Effective for appeals lodged on or after January 1, 1987, all records shall be bound in strong, flexible, looseleaf binders or covers of 25 pt. pressboard material. The front cover shall be 9" x 14-1/2" and the back cover shall be 9" x 15-1/4", so as to allow a 3/4" tab on the back cover. Covers shall have 1" hinged flaps with two reinforced holes, 4-1/4" center to center and 9/16" top to center, end-tab scored for label placement, and shall be fastened at the top, so as to open flat at the top. 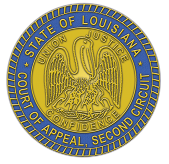 The clerk of each trial court in the parishes of this circuit shall include in the record of each appeal to this court a jurisdictional index in the form shown as Appendix A - Civil Jurisdictional Index, and as Appendix B - Criminal Jurisdictional Index. The jurisdictional index required by this rule is in addition to the indices required by Rule 2-1.4, URCA. Adopted by Court Conference Feb 27, 1984. Filed Feb 27, 1984. Within seven (7) days of the granting of an order of appeal, the clerk of the trial court shall mail to the appellate court the notice of appeal required by the Code of Civil Procedure or the Code of Criminal Procedure. Adopted by Court Conference May 1, 1996. Filed May 1, 1996. Motions/letters requesting designation of the appellate record if such request was made, and the concise statement required by La. C.C.P. Art. 2129. If counsel in a criminal case does not file a brief within the time specified either by Rules 2-12.7 or 2-12.8, URCA, or by the court, the court may order counsel to file a brief within a delay fixed by the court. If counsel fails to file a brief within the delay ordered by the court under this special rule, the court may cite counsel for contempt and impose penalties as provided by CCrP Arts. 17-25. Adopted by Court Conference as Rule 2-2, Apr 6, 1984. Renumbered as Rule 2-3 effective May 1, 1996. As required by C.Cr.P. Art. 844, a written designation of the assignments of error to be urged on appeal in a criminal case shall be filed with this court on or before the date of the filing of appellant's brief and shall include certification that a copy of the assignment has been provided to the trial judge. When filed with the appellant's brief, the assignments of error will not be included in the page limitations as stated in URCA Rule 2-12.2(1). Failure to timely comply with the above rule shall result in rejection of the appellant's brief as authorized by URCA - Second Circuit Supplemental Rule 2-5 and/or shall subject either or both the appellant and his counsel to sanctions as provided in C.Cr.P. Art. 844(C). The Clerk of the Second Circuit Court of Appeal will reject all briefs which do not conform to the requirements of Uniform Rules of the Courts of Appeal – Rules 2-12.1 through 2-12.6, Rules 2-14.1, 2-14.2, and Second Circuit Local Supplementing Uniform Rules 2-4 and 15. (Note URCA Rule 2-12.13). If the Clerk must reject a brief which was received by mail, the brief will be returned at the filing parties' expense. If a brief is rejected and the party subsequently corrects the insufficiency and resubmits the brief for filing within seven (7) days from the date of rejection or by the current brief due date, whichever is greater, the brief will be considered timely for purposes of oral argument only. (Note URCA Rule 2-12.12). For all other purposes, a brief that is rejected by the Clerk on the last day of any delay set by this Court will be considered untimely. Adopted by Court Conference Jun 18, 1998. Promulgated in Compliance with URCA Rule 1-1: Jun 26, 1998. Amended and Promulgated as Amended Sep 27, 1999. Amended and Promulgated as Amended May 11, 2017 and Effective May 31, 2017. In all criminal appeals, counsel for the defendant shall complete the pro se briefing notice issued by this office and attached to the notice of lodging and briefing order. Counsel shall attach the original completed pro se briefing form to a copy of the brief to be filed with this court and mail the notice and copy of the brief to the defendant. The date of notice and mailing to the defendant shall not be later than the date the brief is filed with this court. A copy of the completed form shall also be attached to counsel's brief and submitted to this court for filing within the briefing delays established by the clerk of court. Any brief submitted by counsel will be rejected by the clerk of court if a copy of the form is not attached to the brief at the time of its submission to this court or if the form is incomplete. Adopted by Court Conference Apr 23, 2008. Filed with the Clerk of Court Apr 23, 2008. Promulgated May 2, 2008, Effective May 1, 2008. An original and six copies of the application for rehearing and the brief in support of the application shall be filed. Adopted by Court Conference Nov 26, 1986. Filed Nov 26, 1986. The Clerk of the Second Circuit Court of Appeal shall charge and collect the following fees authorized by statute and by this court rule, effective July 1, 2018. Facsimile filings will only be accepted by this court in the case of an emergency writ. The rules governing acceptance of facsimile filings are contained in Appendix C.
Any Motion to Dismiss submitted in a criminal case shall contain an affidavit signed by the defendant indicating he has been advised of the Motion to Dismiss and agrees to the dismissal of the appeal or writ application. Any Motion to Dismiss received without this affidavit will not be considered by this court and will be returned unfiled. In addition to the requirements for the cover inscription provided by Rule 2.1-3(7) and 2-12.3(i) of the URCA, the cover inscription shall contain, after the name of each counsel of record, the bar roll number of the attorney. Counsel's failure to appear for oral argument once a timely request for argument has beenfiled and the case docketed for oral argument causes inconvenience to the Court and to opposing counsel. Accordingly, it will be the policy of this Court to require counsel to file a written motion requesting leave of Court to waive oral argument. An original and four copies of the motion are to be filed with the Clerk of Court not later than seven days prior to the date of the scheduled argument. Counsel's motion shall contain a statement advising if the request to waive argument is limited to the moving party or on behalf of any other parties and shall contain certification of service listing all parties and all counsel as required by URCA Rule 2-14.2. The Court will act promptly on the motion and Clerk of Court will give expeditious notice of the Court's decision to all parties. If counsel fails to timely file such motion with the Clerk of Court and fails to appear for the scheduled argument, a fine of up to $200 may be imposed and, if imposed, shall be paid by counsel within thirty days from the date of assessment. Act No. 644 of the Regular Session 2006 enacted Code of Civil Procedure Article 2168 which provides for the posting of unpublished opinions on Internet websites and provides that such opinions may be cited as authority. In light of Act No. 644, the Court directs the clerk of court to post the text of all opinions, both opinions designated for hard copy publication and those not designated for publication, to this court's website and to release the text of all opinions to participating publishing companies for electronic publication commencing with opinions rendered by this Court on or after August 15, 2006. In every civil case, appellant, either personally or through counsel, shall give this Court immediate notice of the settlement or pending settlement of a case on appeal. The notice shall include specifics as to the expected completion of the settlement and submission of joint motion to dismiss the pending appeal; the joint motion to dismiss must be filed within 30 days of the notice of settlement unless a later date is authorized by the court. When a civil case has been set for hearing on an appellate calendar and is orally argued, an appellant or counsel for appellant who fails to give the required notice within 14 days after the case is orally argued may be sanctioned for contempt. When a civil case has been set on an appellate calendar and is submitted without oral argument, an appellant or counsel for appellant who fails to give the required notice within 14 days after the last day of oral argument for that appellate calendar may be sanctioned for contempt. Notice of pending settlement shall not prevent the Court from rendering an opinion. All original writ applications filed in this court shall include a completed writ application intake form. The writ application intake form is published in the Appendix E.
The judges and clerks of this Court are authorized to use electronic signatures on all court documents in accordance with law. "Clerk" shall refer to the clerk of court as well as the clerk's deputies and assistants. I hereby verify that all attachments to this brief have previously been duly filed and/or accepted into evidence in the lower court, to the best of my knowledge, information and belief. I understand that failure to comply with this local rule may result in the refusal to consider said attachments. WILLFUL FAILURE TO COMPLY WITH THIS LOCAL RULE MAY SUBJECT ME TO PUNISHMENT FOR CONTEMPT OF COURT. Adopted by Court Conference May 11, 2017. Filed with the Clerk of Court May 11, 2017. Promulgated May 11, 2017; Effective May 31, 2017.